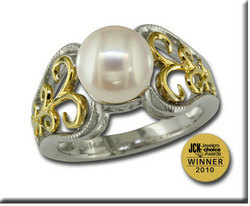 Pearl is recognized as the modern birthstone for those born in the month of June. The word pearl comes from the French, perle and most likely is a derivation from the Latin pernaâ€”meaning leg, after the ham-shaped leg bivalve. Most gemstones are mined deep from within the earth, but pearls are unique In that they come from the sea. Pearls are created inside the living form, the mollusk, when foreign particles find itself within and shape the "gem" from within the oyster. The particles are actually an irritant to the shell's soft internal surface and the lustrous substance nacre is secreted by the oyster to protect itself. Years of continuous secretion of nacre forms this bewitching gem, the pearl. The most valued of pearl types is found in the wild: the natural pearl. 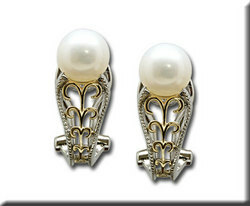 These are considerably rare, and the market for cultured pearls has arisen. These cultured pearls, the majority of pearls used in jewelry, are manufactured in both freshwater and saltwater. The cultured pearl procedure begins with a surgical transplant of a nucleus bead inside the mollusk's gonad. After the bead is inserted, it secretes layers of nacre around the outside of the surface of the implant and eventually produces the pearl. Cultured pearls come in various types which commonly include the Akoya, South Sea, Tahiti, Chinese and Japanese Lake Biwa cultured pearls. An enchanting gem that is steeped in history, pearl has been affiliated with various myths regarding its origin. According to ancient Greeks, pearls were believed to be hardened tears of joy that fell from the goddess of love Aphrodite, as she was born in the sea. Pearls are so versatile that they look stunning against any precious metals such as sterling silver, white, rose or yellow gold, as well as palladium. 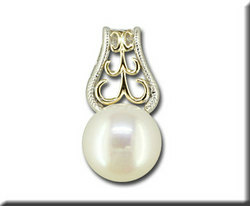 You'll come across different colors apart from white or cream that pearl is widely known for. Cultured pearls exhibit more hues than the natural ones ranging from yellow, pink, orange, black, blue, violet and green.